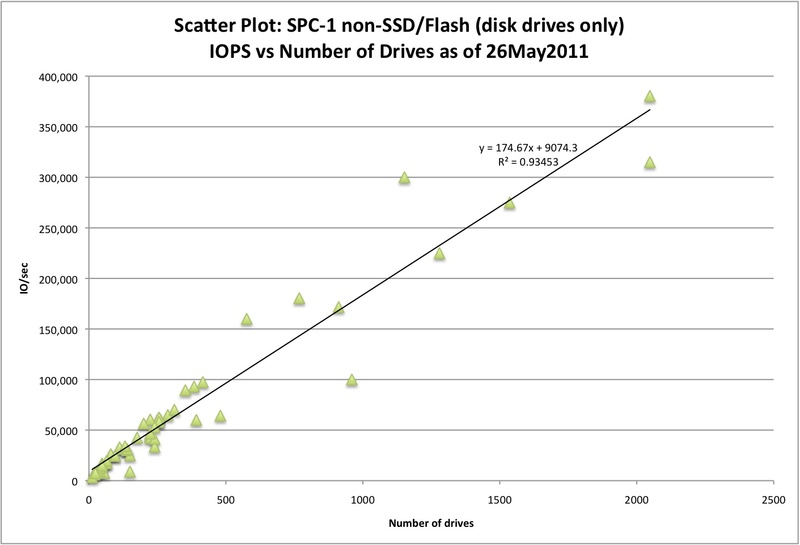 The above chart is from our May Storage Intelligence newsletter dispatch on system performance and shows the latest Storage Performance Council SPC-1 benchmark results in a scatter plot with IO/sec [or IOPS(tm)] on the vertical axis and number of disk drives on the horizontal axis. We have tried to remove all results that used NAND flash as a cache or SSDs. Also this displays only results below a $100/GB. One negative view of benchmarks such as SPC-1 is that published results are almost entirely due to the hardware thrown at it or in this case, the number of disk drives (or SSDs) in the system configuration. An R**2 of 0.93 shows a pretty good correlation of IOPS performance against disk drive count and would seem to bear this view out, but is an incorrect interpretation of the results. Just look at the wide variation beyond the 500 disk drive count versus below that where there are only a few outliers with a much narrower variance. As such, we would have to say that at some point (below 500 drives), most storage systems can seem to attain a reasonable rate of IOPS as a function of the number of spindles present, but after that point the relationship starts to break down. There are certainly storage systems at the over 500 drive level that perform much better than average for their drive configuration and some that perform worse. For example, consider the triangle formed by the three best performing (IOPS) results on this chart. The one at 300K IOPS with ~1150 disk drives is from Huawei Symantec and is their 8-node Oceanspace S8100 storage system whereas the other system with similar IOPS performance at ~315K IOPS used ~2050 disk drives and is a 4-node, IBM SVC (5.1) system with DS8700 backend storage. In contrast, the highest performer on this chart at ~380K IOPS, also had ~2050 disk drives and is a 6-node IBM SVC (5.1) with DS8700 backend storage. Given the above analysis there seems to be much more to system performance than merely disk drive count, at least at the over 500 disk count level. The full performance dispatch will be up on our website after the middle of next month but if you are interested in viewing this today, please sign up for our free monthly newsletter (see subscription request, above right) or subscribe by email and we’ll send you the current issue. If you need a more analysis of SAN storage performance please consider purchasing SCI’s SAN Storage Briefing. As always, we welcome all constructive suggestions on how to improve any of our storage performance analyses.